Wine, Food & Brew Festival – Website Development | ASTRALCOM - Content Strategy, Conversion Marketing and Customer Acquisition. 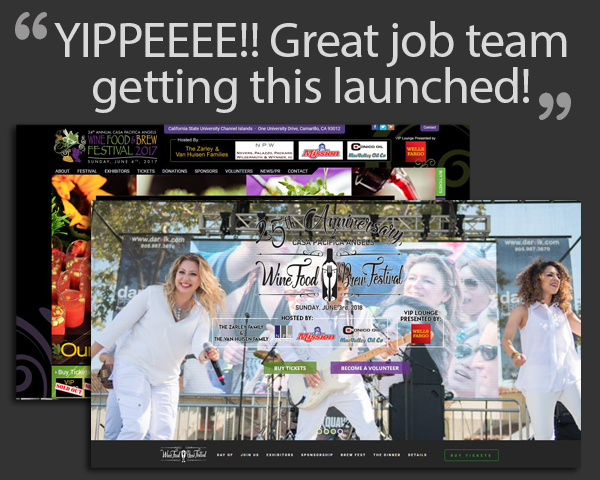 Wine, Food & Brew Festival – Website Development | ASTRALCOM – Content Strategy, Conversion Marketing and Customer Acquisition. 90 days later, she exclaimed, “YIPPEEEE!! Great job team getting this launched!” And within the first 48-hours of ticket sales, they had outsold last year’s preliminary event – the Yummie Top Chef Dinner. Quick turn-around website development projects aren’t easy. It takes superior client/agency teamwork to pull it off successfully. If you have a premiere project that you need a makeover on, reach out to us and we’ll be glad to help you, too.